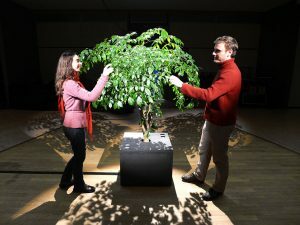 Image of an interaction of a person with the leaves of the plant, and the light behind it glowing softly in response to the touch. Two people interacting with the Lumifolia artwork. What drew me to this project was the fact that it integrate nature with technology. I was intrigued with the beginning title of “interactive garden”, because it was something that I have not heard of until now. My initial thoughts were that an interactive garden just required people to just be in the space, maybe even walk through it, and experience the greenery that is essentially just static. However, with further research, I found that the trees themselves are actually interactive. 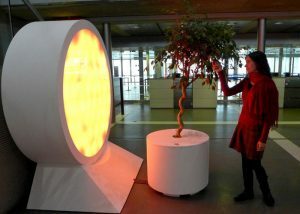 Created by duo Scenocosme for the Parisian Airports Company, this interactive garden “questions sensitivity, artistic, and musical relationships with the plants and the environment” according to its official website. The subtle electrostatic induction from the human body activates a soft light that illuminates the plant itself while its leaves are being caressed. The closer the proximity of the touch, the brighter the lights become. Below is a video visually documenting the process of this artwork. I found it a refreshing find because it was an idea that was very unique and unusual. I believe that this artwork can be developed even further and be used for a greater purpose such as public installation that would help to improve life in and around dark and uninteresting occupied spaces.